Bar Depth: 0.75" Bar Length: 2"
COMMENTS: I used this mold for lotion bars. They turned out adorable. Love this mold! "smaller than I expected but ok"
COMMENTS: Not my favorite molds. The edges gum up and don't release well. They are ok but I have stopped using them for guest soaps because it's hard to remove them. Use them for shower steamers now. COMMENTS: Great product and detail with the molds. Able to use many colors and fill in detail areas using pipettes. COMMENTS: I originally got this for melt and pour but I think it would be nice for bath fizzy tabs since they are round. The design is rather short and the rest of the depth is solid, very similar to the lemon rounds. I found that I really need the freezer to get them to pop out though the plastic is heavy duty. COMMENTS: This is a great mold. It is perfect to make little guest soaps. The butterfly pattern is adorable. "Perfect Gift / Travel Soaps"
COMMENTS: These are absolutely amazing for fun gift / travel soaps. When ever I have extra batter, I always use these as my go to and my customers love them. They are also great for teacher appreciation, small gift set soaps. COMMENTS: I got this mold to use for lotion bars, and it worked great. The butterflies are cute, and the mold leaves very sharp designs so the images come across perfectly. The bars come out a bit small for my liking, but that's not the mold's fault. I might look into making some cute guest soaps with it next time. COMMENTS: I loved this mold for making bath fizzies. The fizzies were big enough for a regular bathtub and to include a color surprise inside. COMMENTS: These are definitely cute! And as the description says... They are only guest sized. They can be made smaller and then used as a top embed in a larger bar of soap. "Great personal size guest soaps"
COMMENTS: I use this mold very frequently, not only to make sets of guest soaps for sale, but to make free sample soaps , using small amounts of soap left over from pouring batches of other soaps. The design is delightful and I am proud to share these little soaps with others. Have sold many sets, too. Highly recommend this mold to others. COMMENTS: Butterflies remind me of my granbabies and beautiful spring days and now I can make them in the form of bath bombs and soaps. COMMENTS: This mold is so easy to use. The soap pops out with no problem. COMMENTS: Love it. Very nice. Embeds,toppers or guest soaps. COMMENTS: The soaps turned out wonderful in this mold, however they were VERY hard to get out of the mold! "Good Mold for Lotion Bars"
COMMENTS: I love the butterfly molds. This is just the right size for my 1 oz. lotion bars. No problem with unmolding so far. COMMENTS: Bought these cute Butterfly molds for making Lotion Bars mostly but possibly MP soap also. The description states 1.5 oz bars but I found that filled to the very top that they are only 1 oz. This isn't a huge problem but I try to keep size and weights close to the same for all my bars as I only have one set price. "Lotion bar for children "
COMMENTS: We used this mold for a new product - our eczema relief lotion bar - and it is a hit with both children and adults. The detail of the butterflies is wonderful. Thank you! COMMENTS: I love these for my mp soap and I sell them as a group. Very popular mold I'm glad I got it!! COMMENTS: I am delighted with this mold. I look forward to using this mold for both m&p guest soaps & my new passion lotion bars. COMMENTS: Adorable to add to any little gift bag. 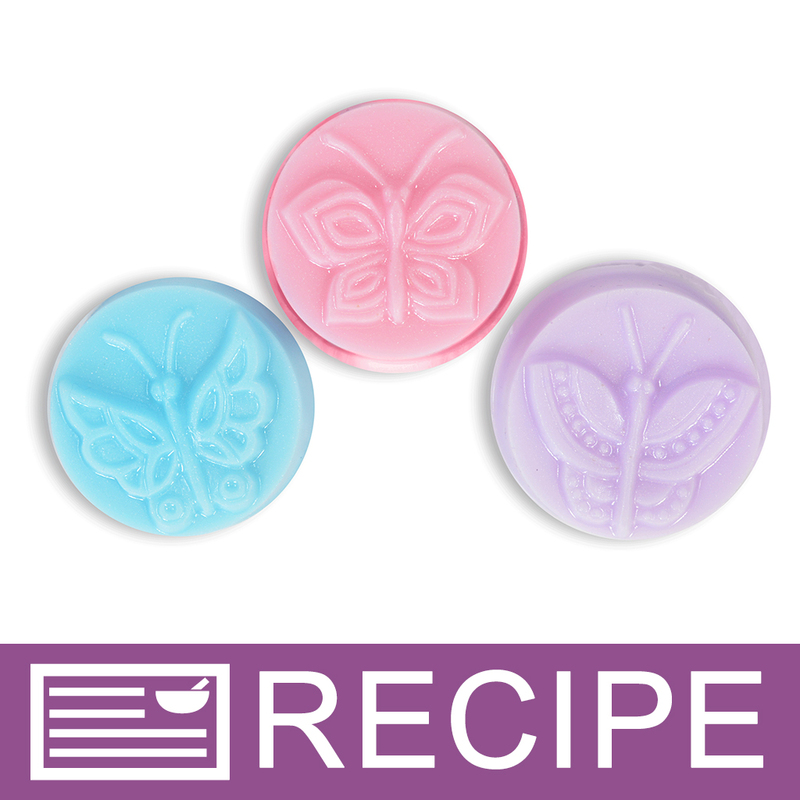 COMMENTS: As a new crafter of candles and soaps I was looking for a cute butterfly mold. These are adorable, thank you. COMMENTS: This mold makes a beautiful butterfly design. I am using it for a variety of products and am very pleased. As always, I enjoy using the Milky Way molds. Will probably purchase more. COMMENTS: Products pop right out no fuss, like the butterfly design. COMMENTS: Unmolds easily and is super cute! COMMENTS: I used these for lotion bars and am completely satisfied with the results. I will also use them for guest soaps. Perfect size. "So is the diameter 3.25 or 2? Is a round mold with 2 diferent sizes." Staff Answer The width at the opening of the cavity is 2". The width at the bottom is 1 7/8". The soaps will be slightly wider at the bottom. We apologize for the inaccurate information for this mold and we have made corrections to this. Thank you for bringing this to our attention. "Can thease molds be used with the 2 oz shallow metal tin set "
Staff Answer Soaps made with the Butterfly Guest Soap Molds (MW36) do fit in the 2 oz. shallow metal tin. Make sure you do not over fill the molds as the height is very close to the limit of the container. "Anyone know how these molds hold up, long term, when used for bath bombs? Does the citric acid eventually start pock-marking the mold?" Staff Answer We have used these in bath bomb recipes but have not used them long term to test this out. I would say yes - but it will probably take a while. I have other molds (not this design, but same material) that are going on 7 years old... eventually fragrance oils from MP soaping and other acidic things tend to make them a little rougher on the inside, but it doesn't affect the quality of the bars.